I first met Kaya in July 04. He belongs to friends. They asked me to start caring for his feet and I turned them down because I didn’t feel I knew enough to care for someone else’s horse, especially one with problems. 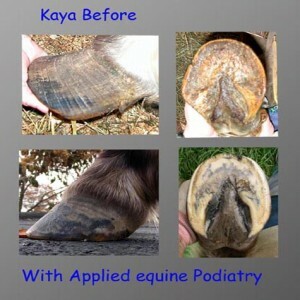 I am sorry I turned them down because Kaya’s feet deteriorated badly. They asked me again. They were told he had foundered and there was nothing that could be done for him. bulbs which had turned to callus. We observed him for a few days and began some Chinese herbal remedies from “Love of the horse”. We used the hoof ailment remedy and one for immune system support. On Jan 2 05 we cleantraxed him. He obviously gained some relief from that treatment because he began moving around a bit but only by dragging his feet. Jan 6 we applied the trim. An amazing amount of dead tissue came off of his soles and frogs, especially the hind feet. By the next morning he had a sparkle in his eye! He was actually picking up his feet and taking steps. He began eating more. Jan 10 we applied solemates and took him for a walk. My taping technique definitely needs improvement! We took them off and Autumn walked him a while longer because he really wanted to move. he trotted a bit and kicked up his hinds with what looked to me like joyful exuberance! He was so animated and full of energy. 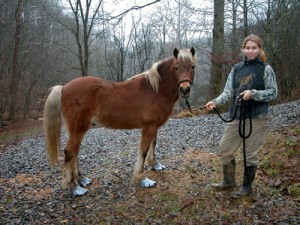 This was a completely different horse than the one that stepped into my barn a week and a half ago. The next day we used solemates again (my taping was better). 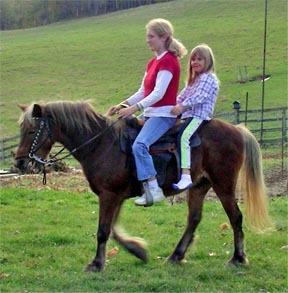 when we took them off Autumn took him trotting and he jumped high into the air and did a flying spinning buck. I wish I had a picture of that! This is an absolute miracle. wall and we can trim again! This entry was posted in Case Studies and tagged false sole, founder, herbal remedies, lameness. Bookmark the permalink. Both comments and trackbacks are currently closed.